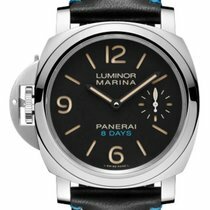 Panerai DLC steel Luminor Black Seal Left-Handed 8 Days & steel Luminor Daylight 8 Days make up this Luminor 8 Day Set PAM00786. Limited Edition of 500. Both; 44mm diameter, water resistant to 300 meters. Hand wound Panerai P.5000 movement completely manufactured in-house, 21-jewels, 8-day power reserve, 127 components. Black Seal – Steel with special hard black coating. Black dial with luminous hour markers and numerals, with seconds at the 3 o’clock position. Brown calf strap with buckle. Luminor 8 day – Steel case. White dial with blue index & Arabic numerals. Seconds at 9 o’clock. Black croc strap with tang buckle. Includes a spare strap for each model and a screwdriver. Box and papers dated October 2017.